Britain's fifth biggest mobile phone operator, Virgin Mobile, says it has made its first annual profit after its best ever Christmas sales period. The network says it recruited 370,530 new customers in the fourth quarter of 2002, a 40% increase on the same period last year. 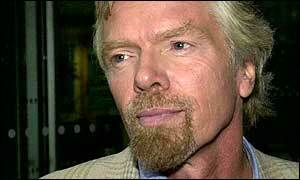 By the end of December it had 2.4 million customers, which Virgin Mobile says gives it a UK market share of 4.6%. Although detailed accounts have yet to be published, the company says it made an annual profit of about �16m. But that figure is likely to contested by Virgin's larger rivals, such as Vodafone and mmO2, as it does not take into account costs such as interest and tax. Because Virgin Mobile is a private business, it does not have to publish its figures to the same detail as its publicly-quoted competitors. Virgin spokesman Steven Day said Thursday's figures showed Virgin, which launched three years ago, was the fastest growing mobile network in the world. He was also bullish about the state of the UK mobile market, which has taken a beating over the past year. "We were quite pleasantly surprised by the fourth quarter, to be quite frank. "There has been a lot of talk about sales being down, but it was better than we expected," he told BBC News Online. Figures due out shortly from Orange and Vodafone would confirm talk of a slowdown has been overdone, he predicted. Virgin Mobile is jointly owned by Sir Richard Branson's Virgin Group and Deutsche Telekom's T-Mobile. Commenting on Thursday's figures, Sir Richard said: "2002 was the best year in Virgin Mobile's history; the year in which it truly proved to be the great success we always knew it would be. "It was the year we acquired our two-millionth customer; it was the year we went into profit; and it was the year our turnover reached �290m. "2003 is going to be even better - by the end of the year we will have more than three million customers, and a turnover in excess of �400m. "Virgin Mobile is proving to be one of the most formidable companies in the Virgin empire, and one of the most dynamic in the telecoms industry."